JBJ has become the new Number 1 International Ticketholder of Melbourne Heart FC, a new team that will compete in the A-League (Australia's premier soccer/football comp) in the 2010-11 season. While his blonde locks and slick rock moves have made him a pop superstar, Jon Bon Jovi’s latest visit to Melbourne resonates with the lyrics of his monster hit, “Living on a Prayer” as he aims to give something special to the battlers among his legion of loyal followers. 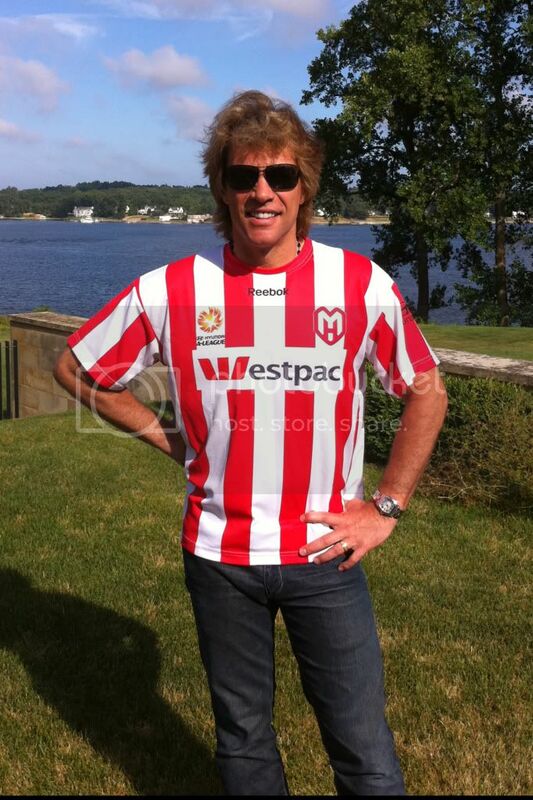 In announcing his new role as #1 International Ticket Holder for Melbourne’s new A League side, Melbourne Heart FC, Bon Jovi has decided to keep the faith with those who don’t enjoy his rock star good fortune and to make his association “mean something real to the fans”. Bon Jovi has purchased 4 premium memberships to the Heart and will donate the prized seats for each home game at AAMI Park to football fans who don’t have the financial means to be able to afford to watch their favourite sport in the atmosphere of a live arena. A lifelong sports fan, Bon Jovi was involved until recently in the AFL – not our AFL – but the Arena Football League in the US as one of the owners of professional arena (indoor) football team, The Philadelphia Soul. Obviously keen to score the poetic sporting quinella, his new partnership, dare we say it, adds Heart to his Soul. While he’ll be filling seats on his sell out Australian concert tour later this year, Jon Bon Jovi decided on an original take on the favoured ticketholder role and is hoping to fill some seats at the Heart’s new home with fans who share his passion for sport but who wouldn’t normally get anywhere near the VIP seats. With record sales in excess of 130 million worldwide, a second career as a movie and TV actor and as an inductee of the American Songwriter’s Hall of Fame, Jon Bon Jovi’s fame Is highly visible. Less well know is his long involvement with a range of philanthropic causes including his own Jon Bon Jovi Soul Foundation. Bon Jovi’s charity involvements and fundraising efforts particularly focus on building homes and access to opportunity for the poor, homeless or displaced, and his initiative to bring deserving Melbourne Heart FC fans to the game they love reflects his ongoing work. Details on how fans can apply to use the Bon Jovi VIP tickets will be available from Monday on www.melbourneheartfc.com.au.